Global conversion contents commerce company CJ E&M (CEO HEO MIN HEOI) announced that 94,000 people came to this event, which was held in ‘LA Convention Center’ and ‘Staples Center,’ iconic symbols of Los Angeles, US, for 3 days from August 10 till August 12. To spread K Lifestyle globally, CJ E&M has been holding the world’s largest Hallyu festival, KCON, in America, Central and South America, Europe, the Middle East, Asia and Oceania, for a total of 19 times since 2012. This event in the US was heated up with the fans in their teens and 20s, and leading foreign media, such as Bloomberg, LA Times, The Ellen Show, Rolling Stone and Billboard, covered the event and conveyed the atmosphere. If the number of KCON fans who gathered together in New York last June is included, this year in North America alone, a total of 147,000 people experienced the Korean culture, which is the largest figure ever. This time, the size of the event and the number of concert seats were increased. A total of 208 companies and organizations, including global enterprises, representing their respective areas, e.g. Toyota, State Farm, McDonald’s and Warner Brothers, and Korean enterprises and institutions, leading Hallyu, e.g. AmorePacific, Kakao Friends, Asiana Airlines, LG Electronics and Korea Tourism Organization, were all present at the venue, and introduced differentiated products and new products. 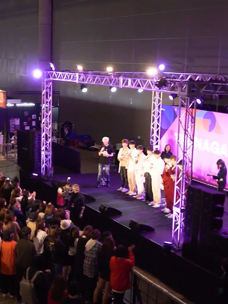 Also, K-Pop artists like TWICE and MOMOLAND participated in the convention programs to communicate with local fans and spread K-Lifestyle, and had a great time. In particular, CJ cooperated with government agencies like the Ministry of SMEs and Startups, Korea Institute of Startup and Entrepreneurship Development, Korea Foundation for Cooperation of Large and Small Businesses, Rural Affairs and Seoul Center for Creative Economy and Innovation to invite 78 promising Korean SMEs (① K-Collection ② 40 companies, Product 101 Challenge ③ 30 companies, CJ Startup Challenge ④ 8 companies) to KCON, and set up a model case of win-win management with the global fleet-type platform focused on cultural contents. Before the event, ▲ some companies had a chance to sell their products on global online malls, i.e. eBay and Amazon, ▲ in LA, they had a meeting with local buyers, and ⑤ ▲at the venue, they held promotions and exhibitions to check the response of consumers, setting down the foundation for overseas expansion. aDuring the convention at the LA Convention Center, more than 200 programs were carried out so that people could experience various forms of Korean culture, e.g., K-POP, Beauty and Food. 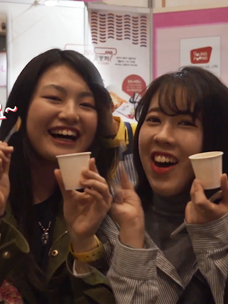 This year too, in line with the K-Beauty fever fueled by Hallyu, ▲visitors enjoyed the K-Beauty Station where K-POP Artists and K-Beauty Creators demonstrate makeup and promote the latest trends, and▲ the Beauty Block where people can experience and buy quality products. 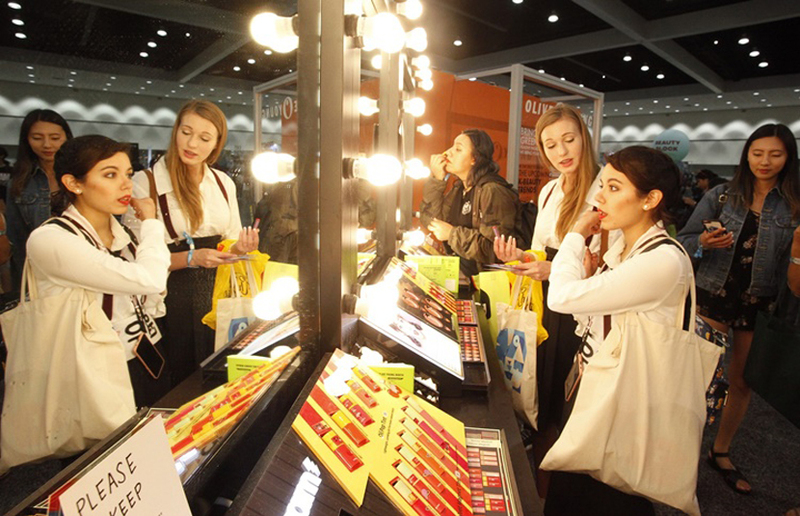 The popularity of K-Beauty among local fans could be realized. In addition, a total of 250 panelists, including Hallyu-related experts and famous local influencers like K-Dance Choreographers, K-POP Producers and K-POP Reporters, participated, and discussed such topics as ▲K-POP Audition, ▲ changes in the influence of K-POP, ▲ making K-Food and ▲ career advice. The convention was filled with substantial programs that will enable people to see various kinds of information, eat and experience a lot of things in one place. Reflecting this trend, to target local youths, KCON planned and introduced new programs taking advantage of the synergies from the convergence of Hallyu contents like K-POP and K-Fashion with commerce, drawing enthusiastic responses from the fans. 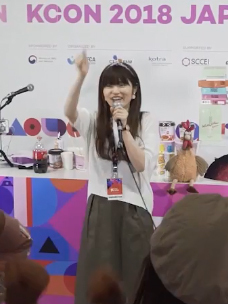 At the convention, the CJ E&M O SHOPPING Division sold products, which resulted from the collaboration between its own fashion brand ‘Ce&’ and the E&M Division’s representative IP ‘Wanna One’ at the site, and prepared various events using VR (virtual reality), and the partner creators of DIA TV also visited the corporate booth and promoted quality K Products, and conducted marketing activities that combine offline, social media and digital. On the first evening of the event, the new KLUB KCON concert, which expanded genres, e.g. K-Hip-hop, K-EDM and K-Performance was held, and on August 11 and 12 at the Staples Center, a total of 19 teams⑥ came on the concert stage, and captivated local fans with spectacular performances. KCON sold all the tickets in the shortest time ever. The audience members who filled the 16,000-seat concert hall sang along in Korean, danced and thoroughly enjoyed the concert with passion. ▲KCON 2018 LA was filled with the enthusiasm of Hallyu fans. ▲Hallyu fans are leaving messages rooting for K-POP Artists on T-shirts. Meanwhile, CJ received a commendation for its contribution to the local business, economy and cultural status of LA from the LA City Council last September, and it will receive the Korea Society’s James A. Van Fleet Award in recognition of its contribution to the promotion of the Korean culture in the US this coming September. KCON will hold the KCON in Impact Arena and Impact Exhibition Center in Bangkok, Thailand for the first time in Southeast Asia for two days from September 29 till September 30 to support the expansion of the K-Lifestyle market, following Japan in April, New York in June, and LA in August.